The other day I tried out the Oculus Rift for the first time. 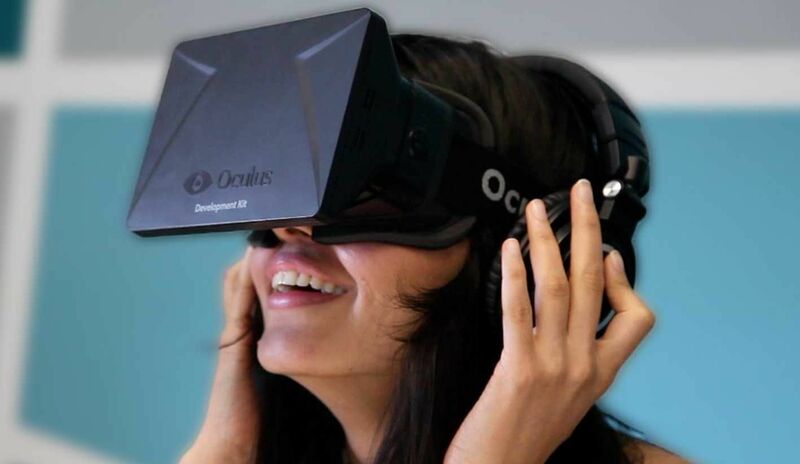 The Oculus Rift is a a virtual reality headset for 3D gaming. The experience was unnerving, immersive, and seriously awesome. Testing out a demo 3D environment, I found myself standing outside a villa on a cliff overlooking a glistening, realistic sea. Moving my head around in real life enabled me to look left and right, to watch dandelion seed heads float by in the virtual breeze. What was disconcerting and a little unsettling is that as it’s just a headset, not a full body suit, so moving your head moves your view but moving your arms does nothing. When you look down you see space where they should be, as if they’ve disappeared. To move around the virtual environment you still need your keyboard or controller, so the ‘immersiveness’ of the experience is still somewhat restricted. NASA’s Jet Propulsion Laboratory have taken the Oculus Rift, the Xbox Kinect and a robotic arm and have put them all together – forming one super immersive robotic experience! Use of the Kinect means the Oculus Rift responds to full body movement, not just the movement of your head, whilst the robotic arm means you can simultaneously do things in real life. The Oculus Rift gives you the first person perspective of ‘doing’ a virtual task whilst the Kinect camera syncs your movement with a robotic arm (or robotic avatar) so you can ‘do’ things in another location… like fix things in outer space. Pretty damn cool. This entry was posted in new technology and tagged dont be a hayter, future of immersive technology, immersive technology, louise hayter, nasa and the oculus rift, nasa virtual technology, oculus rift, oculus rift avatar, what is the oculus rift. Bookmark the permalink.